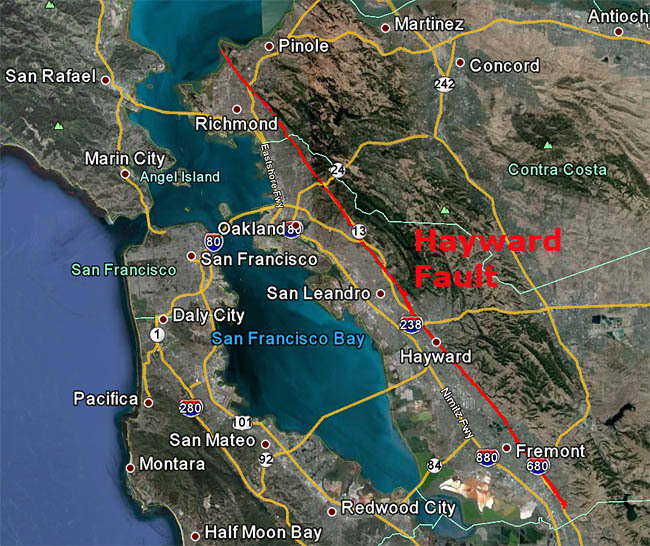 The Hayward Fault is around 119km long and runs along the base of the hills east of San Francisco Bay. It is a right-lateral strike-slip fault. It is considered the fault with the greatest near term risk of major earthquake and resulting damage in the Bay Area. The largest quake on the Hayward Fault in recorded history occurred in1868, with an estimated M – 7.0. It was centered near the southern part of the fault near the then small town of Hayward, giving the fault its name.